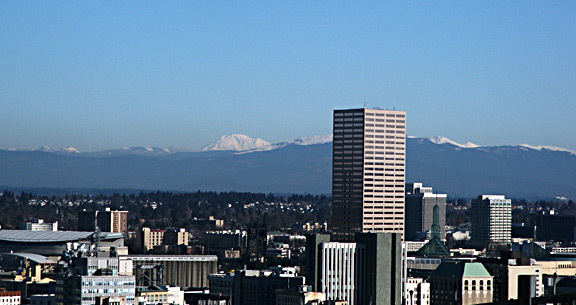 Portland on a clear day boasts a world-class panorama of prime snowy peaks, dominated by Mt. Hood at 11,245 ft., and 8,367 ft. Mt. St. Helens, which these days you might see sending up a smoke plume. Also visible on really clear days and from the right spot within the metro area are three other giants, 14,410 ft. Mt. Rainier, 12, 276 ft. Mt. Adams, and 10,495 ft. Mt. Jefferson --- Portland ought to be nicknamed "The City of Mountains," right along with its well-known moniker "City of Roses." --- In the image above, you are seeing Portland's second tallest building paired with the Northwest's second tallest mountain--- Mt. Adams, which is the second highest peak in the vast sweep of big peaks running all the way from the Canadian border to California's Mt. Shasta....And a word about the manmade "mountain" in the foreground, the U.S. Bank Tower-- if the slope of downtown Portland is taken into account, some claim that the Tower is actually the highest building in Portland (or, for that matter, in all of Oregon). What is the "Big Picture" of the climate of Portland and Northwestern Oregon? Click here. Link to a much closer view of Mt. Adams: "Mt. Adams, Lonely Cow"
Final note about image above: the "Silver Star" area shows to the right of the bank tower--Silver Star lies on the Washington side of the Columbia River, rising to well over 4,000 ft.. It's the closest range of higher peaks to the Vancouver area, and there is some pleasant hiking to be had in its highest reaches. Ending note: Atwater's, a prime eating place for those loving high places formerly perched at the very top of the U.S. Bank Tower, some 500 ft. high over downtown Portland. Unfortunately, it closed in February, 2001. KATU Sky camera located at top of U.S. Bank Tower- see current view!